Another question we've been asked is "how do I choose a new helmet?" With helmets ranging in price from a few dollars to many hundreds of dollars, and available in many brands and styles, this truly is a valid question. Seeing as helmets are a safety item, it is a legal requirement that the helmet you purchase conforms to Australian Safety Standards. 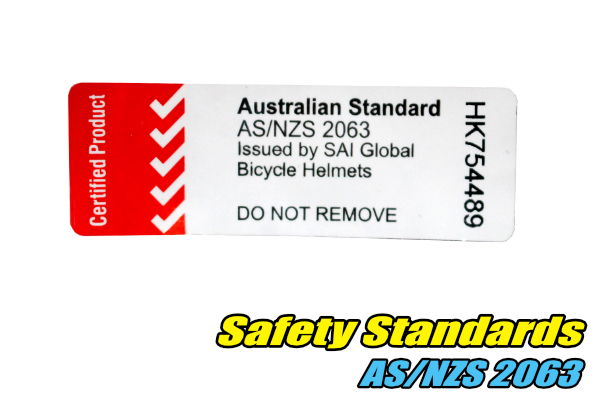 Inside the helmet will be a sticker from the Australian and New Zealand standard AS/NZS 2063 as shown in our pic or similar. It will definitely have AS/NZS 2063 printed on it. Reputable brands purchased from your local bike shops will all have a sticker like this inside. This means the helmet meets the standard, however, it's worth remembering that more expensive helmets can exceed the standard due to advanced technologies they employ. Helmets purchased online may not meet our safety standards, and therefore may offer inferior protection. Helmets are an item best bought in your home country. The next most important factor is correct fit. We all have different size heads and they are often a variety of shapes as well. Add to that hairstyle and helmets are expected to fit a wide range of noggins! And that's without mentioning that some of you probably want the helmet to match your bike, riding gear or lipstick. However, if a helmet is not the correct fit, much of it's safety may be negatively affected. So, there really is only one way to achieve this, and that's go and try out helmets until you are happy that the helmet fits properly. This means taking the time to adjust the straps and any tensioners to ensure the helmet sits comfortably and in the right position. A good bike shop salesperson should be able to assist you to find the best helmet for your budget and be willing to help you to correctly adjust it. If there's anything special about the helmet, they should be able to tell you about it. If you are unsure about the helmet, don't buy it and keeping looking. We give you some hints on finding the right helmet, and getting the correct fit, further down in this article. Tensioning system - many helmets have a tensioning system (usually at the back) to tighten the inner strapping that helps adjust the size of the helmet to grip better to your head. This is usually accomplished with a small wheel or sliding adjustment. Peak - unless you are choosing to use a road cycling helmet (which some people do), the helmet should have a front peak to help keep the sun and rain out of your eyes. In a forest on a bright day, a peak can be a nice feature in the mottled light. Many peaks just clip or velcro in place, however some more expensive helmets offer adjustable peaks. Ventilation - in warmer weather, you may appreciate a helmet with plenty of ventilation. Ventilation is obviously achieved by designing plenty of holes into the helmet. This also aids in reducing the weight of the helmet as well. Again, a more expensive helmet will achieve good ventilation without compromise to safety. Padding - as most helmets use expanded polystyrene foam (EPS) covered by a plastic (or similar) outer cover, the inner, comfort padding is another important feature. Protective coverage - when comparing helmets, look at the overall design and how much of your head is protected. Some helmets will come further down the back of your head or give better protection near your temples than others for instance. Technologies - due to the range of price, helmets will offer different technologies. Some helmets have internal skeletons within the EPS foam to stop it exploding under severe impact. EPS foam is crushable to spread and absorb the energy of the impact. Better helmets tune the EPS foam with density or multiple thicknesses throughout the design. This tunes the helmet to fit the helmet’s application and expected impacts. Outer covers are not just there for good looks either. The cover protects the EPS foam from external damage and also provides a slick surface that doesn't grip the trail if you fall and skid along. A recent technology worth mentioning is MIPS which is available in several brands. MIPS stands for Multi-Directional Impact Protection System. This reputed to be a 'revolutionary' technology that lets the helmet slide relative to the head, adding extra protection against rotational violence to the brain from angled impacts. That's a mouthful isn't it? In short, there's a thin layer inside the helmet designed to allow your head to move further in an accident without the helmet forcing it to stop too suddenly. As this is all achieved in milliseconds, there is debate as to whether MIPS really offers an increased level of protection or not. This is because if your helmet is snugly fitted, your scalp allows a non-MIPS hemet moves in the same way as a MIPS equipped helmet. Perhaps the combined movement of both scalp and MIPS is an advantage though. Worth considering. That's a tough question. Spend a little, and as long as the helmet has the AS/NZS 2063 sticker, it's legal and hopefully provides a reasonable level of protection. Spend a lot and, if you've chosen wisely, you get a much better level of protection. Therefore we can really only suggest you spend as much as you can afford on the best fitting helmet you can find. This is a decision for you personally taking into account the level of protection you want and your budget. Stick to the reputable brands though. You'll recognise them easily as they will appear in multiple shops and will offer a wide range of helmets at various prices. Some quality brands (in no particular order) are Kask, Giro, Specialised, Troy Lee Designs, MET, Limar, POC, Fox, Laser, 661, O'Neal, Scott and there are others of course. When should I replace my current helmet? Most helmet manufacturers will tell you to replace your helmet after any accident that included impact to the helmet. And we can't recommend anything different. It is possible to have internal damage to a helmet that is not visible externally. How much is your life or mental capacity worth to you? Many people however, choose to use their own judgement. If the impact was light, and there is no discernible damage visible, they'll often keep using the helmet. 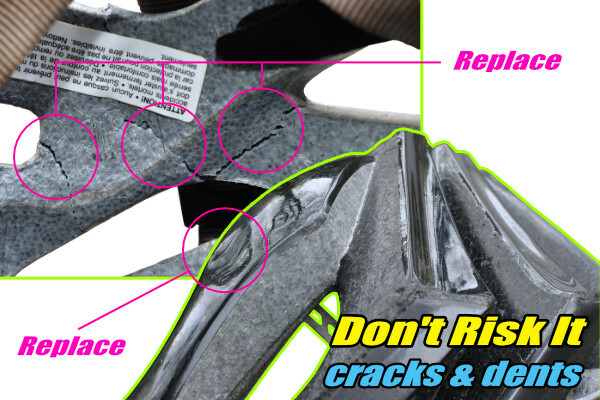 If small dents are observed, they may also choose not to replace the helmet. If the dents are substantial though, the EPS foam's ability to absorb impact has definitely been compromised, so replace the helmet. Without doubt though, if you can see anything that looks like a crack in the EPS foam, replace the helmet. You just don't know how the helmet will react with another decent impact. Some helmet manufacturers are happy for their helmets to be used for as long as 8 years if it never sustains any impacts. However, it's probably safer to replace it after 5 years of use assuming it makes it that long with no impacts. Here is a list of considerations and hints. When correctly fitted, you should be able to feel the inside of the helmet right around your entire head. The helmet should sit just above your eyebrows (maybe a finger width or two) and sit level without interfering with your forward vision. 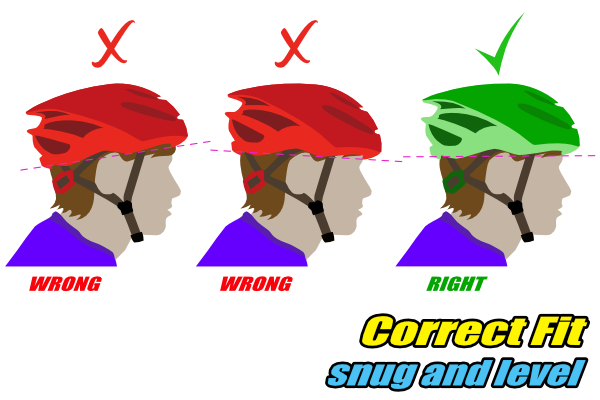 If the helmet has a tensioning system (usually at the back), you should be able to tighten it so the helmet fits snugly. The straps should form a triangle just forward and below of your ears. The straps should be adjusted tight enough so that the helmet moves no more than a centimetre or two from level and you can feel your scalp move. If the helmet dips too far forward, tighten the strap behind your ears. If the helmets rolls too far backward, tighten the straps in front of your ears. With the strap buckled, check the buckle stays buckled by giving it a quick tug. Nod and shake your head around a bit to see how well it stays in position also. No point it performing nicely while you stand in the shop, but then shifts backwards or flops down forwards and covers your vision the moment you hit the trail. Is the padding suitable for you? Does it give enough comfort? Is it replaceable? Hopefully, if you are in the market for a new xc helmet, this helps.